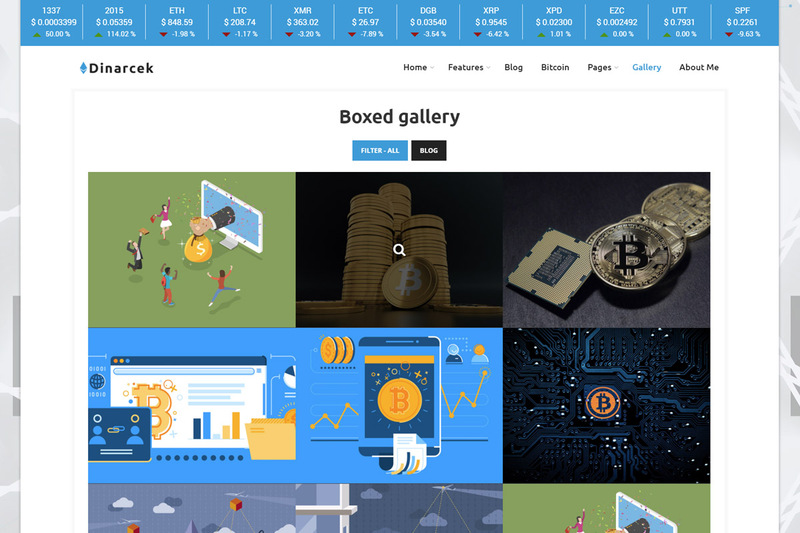 Dinarcek is your number one WordPress Bitcoin Blog theme if you want to join the cryptocurrency industry in style. There is no need for you to build from scratch anymore. When a powerful tool for creating outstanding websites for the coin market is available, you can win easily. Choose wisely, and you can have your page up and running shortly. With Dinarcek Crypto WordPress blog theme you will get a modern blog, with a lot of customizable options. Popular Revolution Slider and Essential grid plugins for presenting the crypto markets are already included. With Dinarcek, you will be in the elite company with other top WordPress blog themes. Are you a Bitcoin enthusiast? Then you absolutely need to buy a theme designed specifically with that in mind and Dinarcek is the perfect blog theme for you! With Dinarcek, you are only minutes away from launching the Bitcoin WordPress website you always wanted. Or Ethereum, Ripple, Monero, Litecoin, you name it. You can efficiently use the cryptocurrency WordPress theme for any virtual currency. Dinarcek is entirely customizable and adaptable, flexible and extensible. You can have a website with the exact design you see in the live preview live with just a click. What is unique about Dinarcek is the fact how simple and effortless it is to manage and maintain a website with it. This also brings us to one important thing. Everyone can use Dinarcek to its full potential. Beginners and advanced website builders, with Dinarcek, creating top-notch cryptocurrency blogs is a breeze. 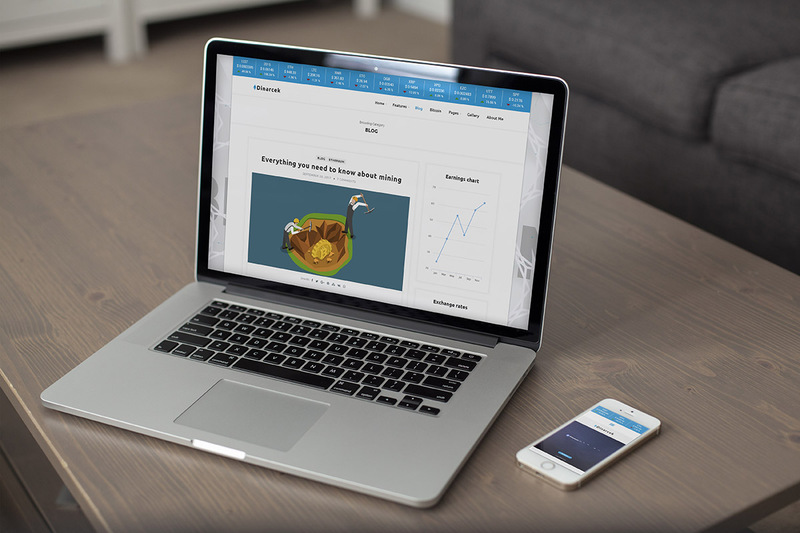 Our developers and designers spent countless hours crafting the ideal layout for Dinarcek. The outcome is a minimal and sophisticated theme for you to show your fine cryptocurrency content and guides. Typography adds a special touch to the theme. With Ubuntu as heading font, the feeling of the theme is unique and will be loved by everyone that appreciate an extra spark on the website. It will be among the best bitcoin websites for sure. If you are looking for a beautifully designed WordPress blog theme with pink and purple tones that is also lightning fast, look no further. Dinarcek’s design and code has been built specifically for optimal website performance, you can pick and choose what to show on your site, and no extra resources will be loaded. The cryptocurrency plugin that we use in the theme is also available for free on our website. You can also check all the shortcodes and documentation in the post. It is packed with features and very easy to set up. Bitcoin and crypto industry is in full throttle and if you wish to add Bitcoin shortcodes and widgets in style we developed a free WordPress plugin that does just that. Thanks for checking it out. Carefully crafted bitcoin theme comes with a special one click demo install. It allows you to install the demo content quickly and efficiently, without any XML files. Furthermore, it is advised to use this demo importer on a clean WordPress installation. No more XML files and tedious demo installations. Simply set whether you wish to import Revolution Slider and Widgets and you are ready to go. Slider Revolution is one of the leading responsive slider plugins for WordPress. It can display your content in ways that are attention captivating, and pleasant to look at. Whether you need a Slider, Carousel, a Hero Image, or transform the whole of your Front Page — Slider Revolution makes the process take only a few minutes of your time. This is possible thanks to the drag & drop slides editor. We are including this premium plugin with each purchase of Dinarcek for free. You also get all three demo sliders that are presented in the theme. Grid Layouts are some of the most trending design subjects in the recent two years. You’ll see plenty of photographers rely on this design style because of how easy it is to display your portfolio on a single page. With Essential Grid, you can create custom portfolios, blog post layouts, image galleries, WooCommerce Stores, pricing tables, service layouts, product sliders, customer reviews, social media streams, and an unlimited number of other uses. All based on what you want to add to your own website. We are including this premium plugin with each purchase of Dinarcek for free. 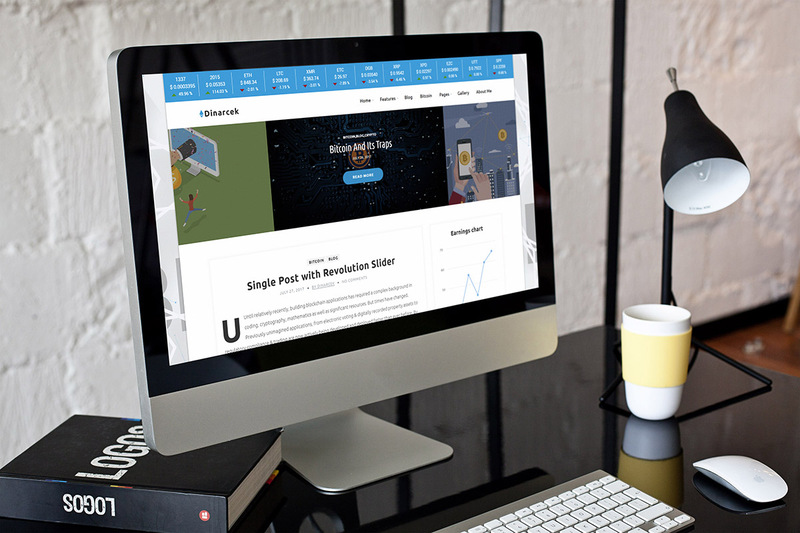 The best WordPress cryptocurrency themes come with great SEO flexibility, and we pride ourselves on our ability to make Dinarcek an SEO-friendly theme right from the start. Our code is semantic and follows the latest HTML5 and CSS3 best practices, ensuring that the site is in compliance with the latest requirements of modern search engines. We know how important it is to be able to customize the color and layout scheme of your blog, without the need to dig deep into the codebase of the theme. Dinarcek gives you the option to modify the color scheme of your blog or website in any way imaginable, and you can select custom layout elements based on your requirements so that your blog is never cluttered with something that you don’t want to be there. Social media and email newsletter support are added with third-party plugins which integrate seamlessly in Dinarcek. You can then add custom widgets to your sidebars and widget areas to include social media links, and custom-built email newsletter signup forms to build your email list right from the start. Apart from the design, it’s also the plugins that you choose that make your blogging experience so much better, and Dinarcek proudly supports all known and popular WordPress plugins commonly found to be used by the average WordPress website: Contact Form 7, Facebook Widget, Instagram Feed, MailPoet Newsletters, Recent Tweets Widget, Shortcodes Ultimate, Slider Revolution, Essential Grid and many more. 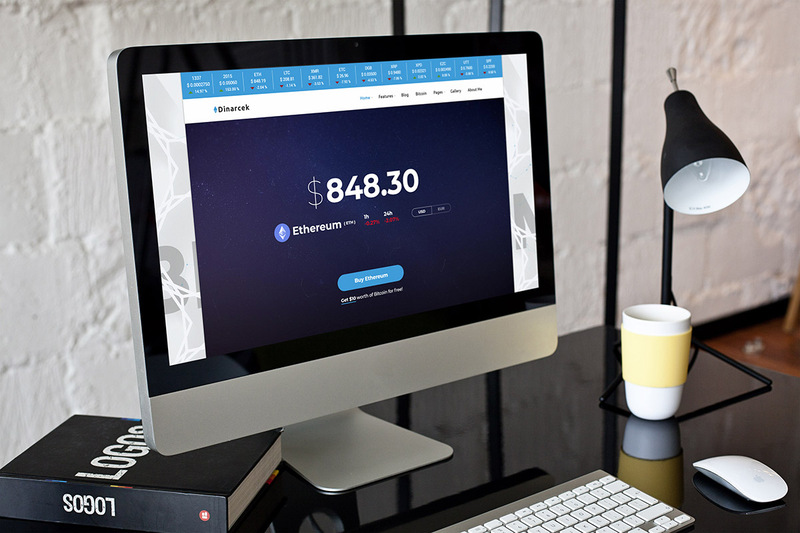 Dinarcek is a responsive-first built WordPress bitcoin blog, which means that you won’t have to worry about making your blog or website mobile friendly — it already is out-of-the-box. Whether your readers are viewing from their iOS or Android devices — the design will automatically scale to suit their device resolution, without any additional work required on your part. For support please contact us via the support tab. You can always count on our helpful staff to offer you assistance and guidance to successfully launch your bitcoin website. Whenever you face a barrier, hit us up and together we will solve any issue you may have. 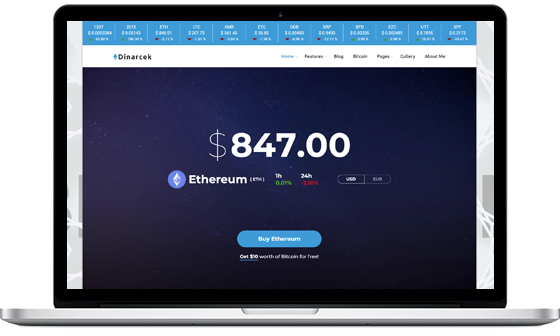 Skyrocketing your cryptocurrency project to the Moon and then Mars is inevitable with Dinarcek cryptocurrency & Bitcoin WordPress theme.